Complaining to music is a performance art with a growing audience. Lyrical and funny, these choirs captivate listeners with lyrics that strike to the heart of our everyday lives. energy people put into complaining into something powerful like music. They have created an amazing outpouring of creativity in many different countries. I wrote an article about this last November, but now they’ve gone worldwide. Everything you ever wanted to know about Complaints Choirs, including how to organize one can be found on this site. There are now 10 operational Complaints Choirs and the number keeps on growing. I think the Hamburg Complaints Choir is one of the most enjoyable, although the Complaints Choir of the Poikkilaakson Elementary School is a close second. 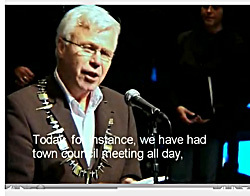 Even the Mayor of BodÃ¸ in Northern Norway is performing with their Complaints Choir! Check out his ceremonial necklace. 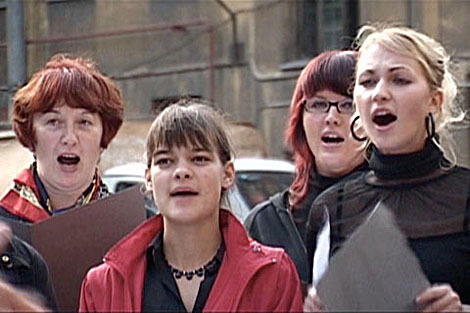 The St Petersburg Choir is truly the saddest, although their singers have their bright and cheerful moments as you can see in the picture at the beginning of this article. 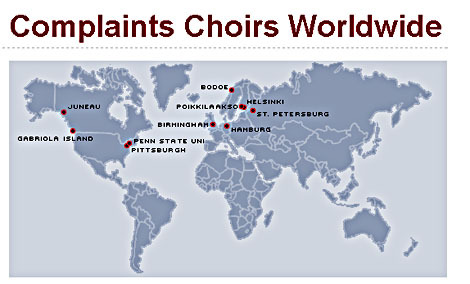 Complaints Choirs are currently forming in London, Pittsburgh, Juneau, Gabriola Island off Vancouver Island, and at Penn State University. Tired of not being heard? Form a Complaints Choir and get on YouTube! This entry was posted in Music and tagged Birmingham Complaints Choir, BodÃ¸ Complaints Choir, Complaints Choirs, Gabriola Island Complaints Choir, Hamburg Complaints Choir, Helsinki Complaints Choir, Mayor of BodÃ¸, Oliver Kochta-Kalleinen, Poikkilaakson Elementary School, Saint Petersburg Complaints Choir, Tellervo Kalleinen, Valituskuoro. Bookmark the permalink.